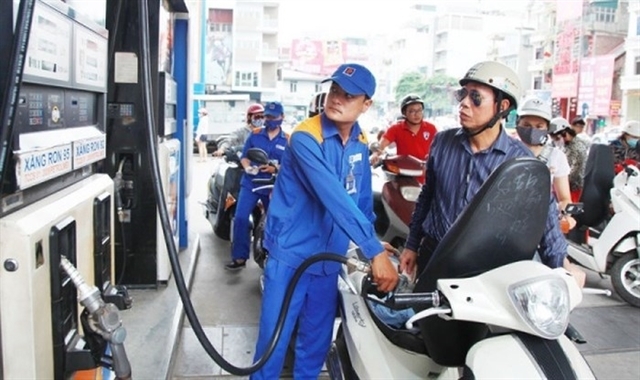 HÀ NỘI — The retail prices of petrol and oil continued to increase significantly in the latest review of the ministries of Industry and Trade and Finance at 3pm on Wednesday. The retail price of bio-fuel E5 RON 92 has been raised by VNĐ1,115 to VNĐ19,703 (US$0.85) per litre, and that of RON95 no more than VNĐ21,235 ($0.91), up VNĐ1,484. The prices of diesel and kerosene went up by VNĐ297 and VNĐ291 to VNĐ17,384 and VNĐ16,262 per litre, respectively. The price of mazut was capped at VNĐ15,617 per kilo, up VNĐ1,127. In April alone, the petrol retail prices were increased by VNĐ3,000 per litre after two continuous hikes. The two ministries said they review fuel prices every 15 days to keep domestic prices up to date with the global market. In the past fortnight, global petrol prices were on the rise at $77.89 a barrel of petrol RON92, up 4 per cent from the previous adjustment. The price of RON95 was 4.4 per cent higher to $79.8 a barrel. In addition, the two ministries said they used the petrol price stabilisation fund so far this year to stabilise the retail prices despite rises in the world market. It was the reason this time, they decided to increase retail prices while reducing the use of the fund. Accordingly, the use of stabilisation fund for petrol E5 was VNĐ1,456 per litre, reducing VNĐ586 per litre from the previous adjustment while that of RON 95 was VNĐ743 per litre, reducing VNĐ561 per litre. The balance of Petrolimex’s price stabilisation fund as of Wednesday was negative VNĐ240 billion, Petrolimex said on its website. This has been the third increase of petrol retail price so far this year.